We are under British control, we know, we don't care. We can gain freedom if we want but that's not even worth. "While soft the wind blew down the glen and shook the golden barley"
And what about Poland now? It is dead. Players have no motivation except entering just because of addiction. 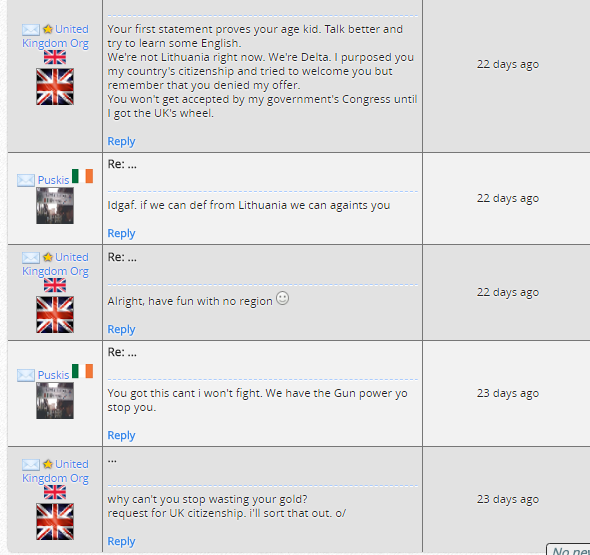 The people rulling Poland have no muties, they just are there to take stuff from Poland Org or rule a bit. And state will not change as why shoud it. The Poland is dead and so is the game. Lucius The Eternal I don't think Poland is asleep they're just runned by multies as usual. Puskis obviously if you don't speak english and you speak other 10 languages it's useless, english is the language of the gods, don't you know? I thought the Irish could speak English? Go home Ireland, you're drunk! Well, as you can see I'm not Irish and do not have a high level of it. But I speak 5 languages Just 2 as native level) How many do you speak? thanks to you, now everyone can see who's crying.